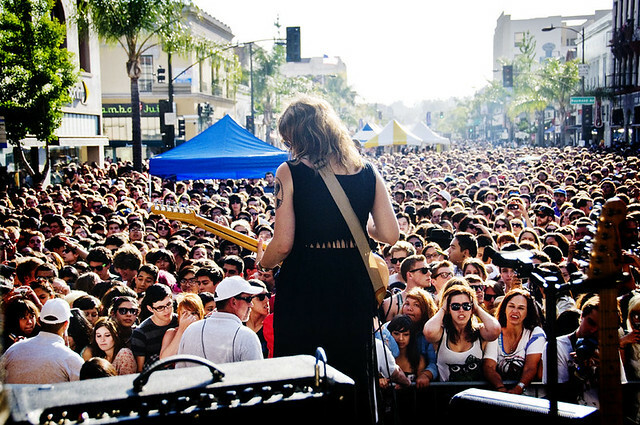 Best Coast performs during Make Music Pasadena. Today, it was announced that Best Coast will play a free live in-show performance at Amoeba Records in Hollywood on October 22nd to celebrate their new EP release Fade Away which drops that day. It's also the first release on Cosentino’s Jewel City label and sets Best Coast off on a new burst of independence and creativity. Just recently, it was announced that Best Coast will be supporting The Pixies on their 2014 North American Tour on select dates beginning in February. The Amoeba show will take place a day after their show at Los Angeles' Fonda Theater, a benefit for Animal Rescue with Baby Alpaca and Death Valley Girls also on the ticket. After the show at Amoeba, they will head overseas to play a few dates Asia.